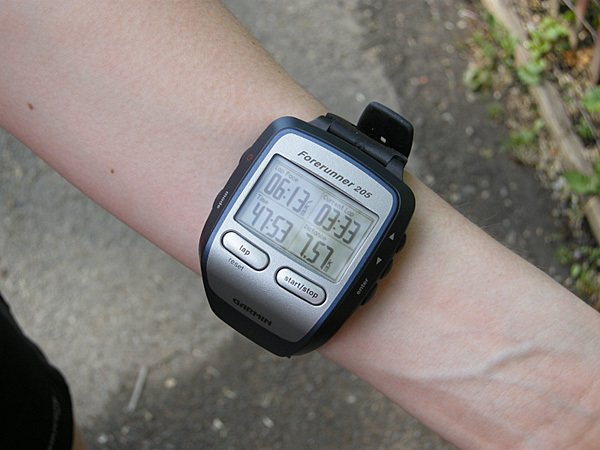 When I bought the Garmin Forerunner 205 last September, I was fine with the fact that it didn’t come equipped with a heart rate monitor, in fact, I was quite over joyed by it. Firstly, I was saving a bit of money and even more so because I bought it in Oregon – no taxes! And secondly, I really had no desire to know if my heart was about to explode from overexertion … if you haven’t already noticed, I like to live in a world of denial. But, I’m also runner who can be easily swayed. It does, however, seem like there’s a lot of math involved, something about subtracting your age from like 230 (I think that’s what the number was) to figure out what your maximum heart rate is, which is a little bit intimidating for people like me who don’t do math (yes, I even have issues subtracting 32!). But when I piped up about my lacking math skills, I was quickly informed that there’s a teacher in our mix – who loves math! She's done me well for nine months, but a marathon girl needs the Garmin big guns! Now, the question is which one do I get. I love the orange 310XT, which would go with so many of my running outfits, but it’s $439, which might be a little out of my price range 😦 I’m not a fan of the touch screen ones, and the slimmed down 110 looks a little too simple for my liking, so that just leaves the bulky red 305. Decisions! Decisions! After the talk portion of the clinic we went for a 6k jaunt and I felt awesome, probably the best I’ve felt in a long time. It was an out and back route and my legs felt great, my body felt great, my head felt great. I was in the zone … my only issue was slowing it down a bit. I was supposed to be doing a 7:08r km pace, but I didn’t get down to that pace until about 2.5 km in. I am trying, though, oh boy am I ever. I am so determined to follow the plan and NOT get injured again! I’ve just got to keep reminding myself is all! Putting things into perspective: While my running gals and I are no longer the leaders of the pack, we are still the fast ones, as one of the gals pointed out, it’s just the runners slower than us didn’t join this clinic is all! Loved it!